When I did the first major re-design of this site, one of the pieces of feedback that I got on the home page was that it wasn’t clear that there was more content beyond the teasers. I think the link color was even more subtle back then, and I guess people didn’t see the “…continued” and realize that they could click the links to get to the full log entries. In order to draw more attention to the links, I wanted to put a little icon in there, about the same size as the text. There are some standard doodads for this (like ◊ or ∗) but I wanted something unique, and the only thing I could think of at the time was signal flags. 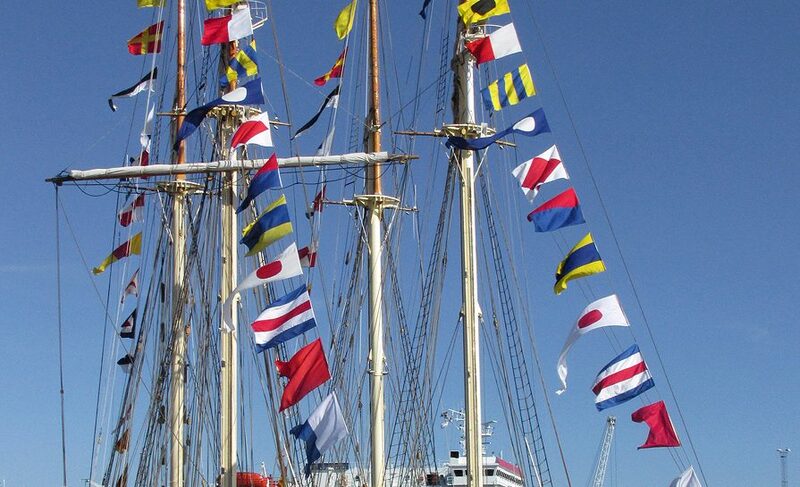 Even though they’re barely understood by the average recreational boater, maritime signal flags are kind of ingrained in the boating (or maybe yachting) lifestyle. They’re everywhere: the place settings, the Tervis Tumblers, the “I’d Rather be Sailing” license plate holder, the dog collar, the saucy Whiskey Tango Foxtrot t-shirts…pretty much anything that you can get in the giftshop from any place that was ever a seaport. I thought that having a tiny set of flag icons to sprinkle throughout the site would be cool, so I made all 26 letters in 10×10 pixel signal flags. I’m sure that you’ll have countless hours of fun and excitement seeing what the full range of profanity looks like in miniature maritime flags. Enjoy. I’ve been looking at these flags for so long, they’re actually starting to get interesting. While each represents a letter, they also have intrinsic meanings. A common one (one of only two that I knew before embarking on this project) is the Quebec flag, which originally stood for “quarantine” and is flown when entering a foreign port to indicate that you need to clear customs, or specifically that you have no communicable diseases on board and are requesting free pratique. They almost all have a meaning, some more serious in nature than others, and there are tons more when they’re used in combination. It reminds me of those lists of anniversary gifts, where you’re supposed to get each other clocks or leather or bronze depending on how long you’ve been married. There are even traditional and modern renditions of the gift lists, as if anyone had done this in any era. ALPHA Diver down; keep clear. Thank you for your wake. BRAVO I am taking in, discharging, or carrying dangerous goods. I am taking on rum. DELTA I am maneuvering with difficulty. I do not know my aft from my elbow. ECHO I am altering my course to starboard. I routinely confuse port and starboard. FOXTROT I am disabled, communicate with me. I wish ill upon your jetski. GOLF I require a pilot. I am holding an extended conversation on channel 16. HOTEL I have a pilot on board. I am using autopilot to maintain collision course. INDIA I am altering my course to port. I routinely confuse port and starboard. JULIET I am on fire and have dangerous cargo. I’ve fallen; can’t get up. KILO I wish to communicate with you. Hey. How’s it going? LIMA You should stop your vessel instantly. I cannot hear you; my vessel is making 165+db. MIKE My vessel is stopped. Drinking since dawn; ignoring all laws/rules. OSCAR Man overboard. Water skiing through narrow channel; keep clear. PAPA All persons should get onboard, vessel is about to sail. Papa don’t preach; in trouble deep. QUEBEC My vessel is healthy and I request free pratique. I am motoring despite good wind. SIERRA I am operating astern propulsion. I am peeing astern. TANGO Keep clear; I am pair trawling. Bikini sighted; altering course to intercept. UNIFORM You are running into danger. Bikini sighted; evasive action. VICTOR I request assistance. Rum supplies critical; send rum. WHISKEY I request medical assistance. Rum supplies stable; send rum. X-RAY Stop carrying out your intentions. Boat rocking; don’t come knocking. YANKEE I am dragging anchor. I only have 12ft of anchor rode. ZULU I require a tug. There is no Dana; only Zuul.